What Does It Look Like When a Child Is Engaged? In order for children to learn, they must first be interested and engaged in what is happening around them. For a child to truly be engaged, they must be motivated by their own curiosity, interest and enjoyment. Observable behaviors of engagement include concentration, excitement and effort. Research shows a high correlation between the level of engagement and the level of achievement. It is active, busy and sometimes loud. It is critical to children’s learning and development because it intentionally focuses on targeted goals and skills and provides an enjoyable environment for learning those skills. 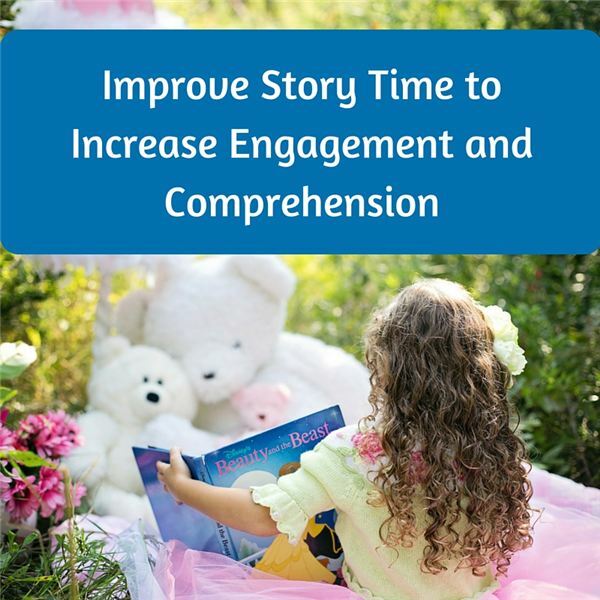 How Can Teachers Improve Engagement During Story Time? Children must be interested, involved, connected and excited about a story in order to be motivated and to gain comprehension skills from the reading. The following is a list of research-based strategies that support children’s learning of foundational comprehension literacy skills. Background Knowledge/Connections: Tap into what the children already know. Ask questions and make connections to what is familiar to the children’s prior experience. If children make a connection from their personal experiences to the story to, the story will have more meaning and in turn, their level of comprehension will increase. Read-Alouds: Use gestures, funny voices, sound effects or anything that keeps the children’s interest. Shared and interactive read-alouds are the foundation of a quality language and literacy program that centers on reading comprehension. Reading aloud with enjoyment increases the chances that children will view reading as fun and exciting. Read-alouds allow for the natural teaching of print concepts and to provide opportunities for the children to become an active part of the reading process. Predictable/Sophisticated: For younger learners, use simple, predictable books (such as Brown Bear, Brown Bear by Bill Martin) that the children can predict what will happen next based on the previous events. As their comprehension increases, move to more sophisticated books in which the children must infer about characters and events (such as The Little Red Hen by Baron Barton). Encourage dialogue and discussion about who the characters are and why did they do what they did in the story. Vocabulary: Quality literature and story time is a natural way to introduce new vocabulary instruction through strong oral language conversations about the story. Chose words in the story that are significant to the story’s meaning. Engage in conversation with the children on what these words mean and use the pictures in the story to support their understanding. Repeated readings: Repeated readings allow children to move past the meaning of the words toward what is actually happening in the story. Point out main events from the first reading as a review for the children and build upon this knowledge as you begin the second reading. Let the children jump in and tell what they remember from the first reading. As you reread the story multiple times, move toward more analytical, open-ended questions, such as, “What is happening here?" and away from the simple, concrete questions of before, such as, “Who is this?" Again, encourage conversation about the story and let the children guide the discussion when possible. Retelling: After multiple readings of a story, provide the children play activities in which they can incorporate characters and events from the reading. The use of manipulatives such as toys, puppets, felt story board pieces or real objects will encourage creative play and retelling opportunities. Let the children take the lead! This is a developmentally appropriate way to assess their understanding of the story through authentic means. Research supports an active, lively, busy, discussion-filled story time. Children must be excited and interested in order to be engaged in the activity and gain learning skills. Through these strategies based on best-practice evidence, teachers can improve story time by increasing children’s engagement and comprehension of picture books. McGee, Lea M., & Schickedanz, Judith A. (2007). Repeated interactive read-alouds in preschool and kindergarten. The Reading Teacher. 60(8): 742-751. Jablon, J. & Wilkinson, M. (2006). Using Engagement Strategies to Facilitate Children’s Learning and Success. Beyond the Journal. March: 1-5. Finn, J.D. & D.A. Rock. 1997. Academic success among students at risk for school failure. Journal of Applied Psychology 82 (2): 221–34.